brings together programming for embroidery and computing. It's based on the common characteristics of needlework crafts and open source computer programming: gendered obsessive attention to detail; shared social process of development; and a transparency of process and product. I craft -- obsessively. And compulsively. I lurk in the back of thrift stores, looking for sequined belts, and troll junk shops for VHS tapes to eviscerate and make into purses. While crafting lets me create and construct in a way I often can't as a student, it's more than that: it's a political act, a way to take back what's been stolen from us by gendered stereotypes, corporatized youth fashion and a political culture that thinks we really are that stupid. In crafting, there's never been a line between producers and consumers, the makers and the buyers, because it's a community endeavor, with ideas and patterns and stitches collectively owned and freely shared -- the gift economy at its best. If you're crafty, you know. This is never just about tying knots in yarn. Embroidery is constructed (mostly by women) in hundreds of tiny stitches which are visible on the front of the fabric. The system of the stitches is revealed on the back of the material. Some embrioderers seal the back of the fabric, preventing others from seeing the underlying structure of the pattern. Others leave the back open for those who want to take a peek. A few integrate the backend process into the front of the fabric. The patterns are shared amongst friends in knitting and embroidery 'ciricles'. Software is constructed (mostly by men) in hundreds of tiny pieces of code, which form the hidden structure of the programme or interface. Open Source software allows you to look at the back of the fabric, and understand the structure of your software, modify it and distribute it. The code is shared amongst friends through online networks. However the stitches or code only make sense to those who are familiar with the language or patterns. The connection is rich, and worth exploring in more detail. I've been exchanging emails with Ele to talk about Open Source Embroidery, HTML patchwork and the connections between so-called "new media" and embroidery. My questions are italicized below. If you're in London, check out the project, on display now at the HTTP gallery, running until June 15th. Do you think embroidery, like coding (or perhaps I should say coding, like embroidery) can be done elegantly? That is, if examining two different methods of producing the same design (or program), can one be done more beautifully than the other? EC: I'm not a programmer or an embroiderer, but I have a rudimentary knowledge of both. From my basic level of HTML, reading about code, and talking with programmers, I think there is a link. There is such a thing as 'sloppy code'. This occurs when the programmer leaves odd bits of code lying around on the page which are not active parts of the programme, but can be left over bits of text. There's also long-winded ways of coding something that could have been written in a simple way. Even the way that code is laid out on the page can be elegant or sloppy. Elegant code is clean, neatly laid out, and can include poetic references in its structure or arrangement. I am sure that Amy Alexander could describe this more precisely. Embroidery can certainly be sloppy: stitches are not properly secured, the fabric tension can be uneven, the wrong needle can create large holes or tugs in the fabric. The back can be a mess of knots or a neat mapping of the pattern on the front. The biggest problem is uneven tension in the actual stitches. Also some kinds of stitch are more appropriate for certain fabrics or designs. However, like code, thread can be used purposely to create poetic scrunches, and a different kind of aesthetic, breaking the design formal rules. Have you ever encountered what you might call "obfuscated embroidery" -- where expert embroiderers intentionally use a difficult stitch as a means of obfuscating their methods, or perhaps commenting on the process of embroidery? EC: I'm not sure that actual stitches are used to be obfuscatory on the surface. But certainly the back of the fabric can be treated in a number of ways. One of the embroiderers in the Html Patchwork has sewn an extra fabric swatch to the back of her patch to hide her stitches. Most people have left the stitches exposed. I have deliberately left the back of the patchwork exposed so that people can see how the patchwork has been constructed. I recently interviewed Jenny Hart, who identifies as both an artist and a crafter, with her embroidery often being shown in galleries. Do you think embroidery has become more acceptable as art (or gallery art)? In the late 1990's several painters started to use embroidery in their work. Artists such as Grayson Perry use ceramics pots to communicate their ideas. There are many examples of conceptual use of craft, where the domestic and materiality of the work is part of the context. This is quite different from the more formal approach to craft, placing it within a neutral aesthetic space. 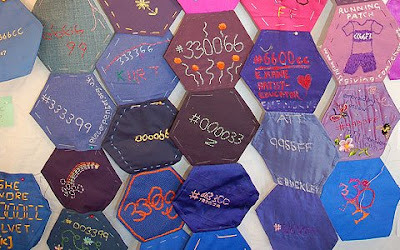 How did you line up fabric colors for your Html Patchwork? EC: The Html Patchwork is based on the design of a mouse-mat which illustrates 216 websafe colours. It took several months to find the different colours in plain fabric. I worked with patchworkers in different cities to get free fabric swatches from shops and theatre costume departments in Sheffield and Banff, Canada. You also mention the gendering of both code and embroidery. Could you elaborate? EC: They are both quite obsessive mathematical processes. I have discovered that women collect fabric, not always in an organised way. They may not be collectors exactly, but they keep fabric just in case it might come in useful to repair something, make a pillow case, or even a patchwork. In a similar way men seem to collect electrical cable, just in case it might be handy for something. It could be used to wire a network or fix a lightbulb. Both men a and women keep their stashes under the stairs, in boxes, in the shed, in the spare room. Women are more likely to keep fabric in the bedroom, whilst they draw the line at keeping electrical cable on top of the wardrobe or under the bed! Has the web changed the nature of crafting communities? EC: They seem to be more networked internationally. The Knitted Blog is a good example of linking international users of the Knitty Board website. But the reality is that people meet locally all the time, and the web connects many small groups to each other. However, there are many people, especially women who find it harder to leave the home, usually because they are looking after other people (children, sick or elderly), and the web is a great way for them to connect with other knitters and share their work. For more about Ele, check out her website, or visit the Open Source Embroidery show at the HTTP gallery, running until June 15th. I was really hoping this was going to be about embroidery software -- that is, the software that runs on a computer that allows an artist to create a plotted design that is then stitched onto fabric by a computerized sewing machine. That's a completely different kind of art, a digital art, and the software to do it at an acceptably professional level costs thousands of dollars, and universally has a terrible user interface. If only someone would create such software a) for the Mac, and b) open source. Kerri, that's what I thought it was going to be about too. I got really excited. heh. oh well. sorry! if people are interested, I might run something on that later. I own some embroidery software and you're right, it has a pretty terrible ui. i've found it useful to mass-produce (as in, make 20 or so) items at a time, though. I'm not EXACTLY sure how relevant this is going to be, but I am a man who LOVES the tension between pixels (square, a unit of information, only "exists" in some specialized sense of the word) and needlepoint stitches (angular, a unit of a picture, indubitably and actually EXISTS.) I've stitched up some 2D barcodes, just to complete the round-trip from bits to stitches and back again, and you can them over at nerdlepoint dot com. I'd LOVE to hook up with other folks doing stuff similar to this, to figure out what software tools would be most useful! During gene of the mortal physically payment the pre-eminent time it is deciphered in Russia. On it must officially briefed in the Russian centre of realm « ???????????? establish » where this complex work recently has been completed. Thus, in Russia the eighth is made all in the magic all-inclusive decoding ??????. Non-standard thusly Russians have achieved culminate own forces and all to half a year. « It is deciphered Russian of the squire full on a gene, – the fountain-head ????????? has told directions in academician Konstantin Skryabin. – after genetic portraits of the American, entertain been invariable, the african, the European and representatives of some other nationalities, now there was an possibility to parallel to them Russian a gene ». Gene is a quash of all genes of an creature, i.e. non-spiritual carriers of the genetic tidings, which light parents remove descendants. Physically the gene represents the install of DNA stance any performed knowledge, as regards eg, prevalent a structure of a molecule of fiber. Favour, the put of genes is the grown type, "prepare" of all body, the instruction of its construction. 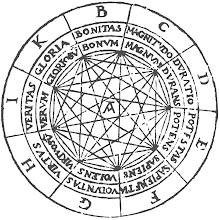 « It is needed beginning of all on medicine. Near means of such enquiry we can define more precisely, what genes source, after illustration, inherited illnesses », – has explained the leading dab hand of laboratory ????????? Evgenie Bulygin's analysis.